← What’s all the buzz about? Bees got microbiomes too! This is a guest post by Alicia Mastretta-Yanes, a CONACYT Research Fellow assigned to CONABIO, Mexico. Her research uses molecular ecology and genomic tools to examine the effect of changes on species distributions due to historical climate fluctuations as well as the effect of human management and domestication. You can find more about her research in her website: http://mastrettayanes-lab.org. She tweets about reproducible research, genomics and cycling Mexico City as @AliciaMstt. I decided to write this entry while reading the Results of the Molecular Ecologist’s Survey on High-Throughput Sequencing, because it stated that 89% (n=260) of molecular ecologists working with High-Throughput Sequencing are performing the bioinformatic analyses themselves. I could not think of a better place to share a tool that I think anyone performing bioinformatic analyses should know: Docker. I will explain what Docker is in a moment, but first let me state why I think we all should turn our eyes to it. 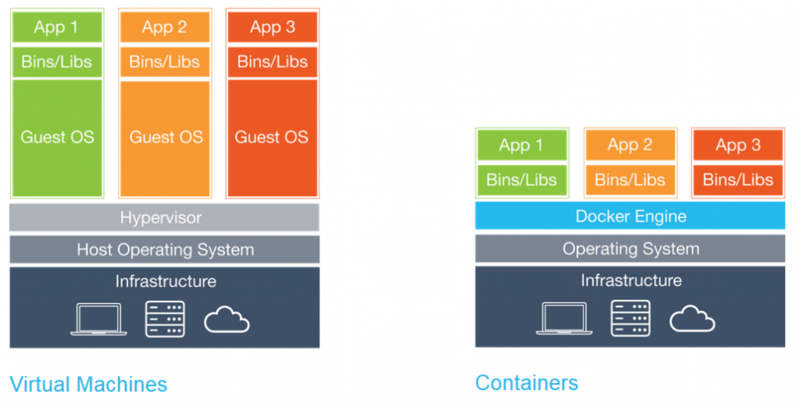 Docker is an open-source (yay!) engine that automates the deployment of applications into containers, so that you can install inside such a container the software you want, along with all what it needs to run: files system, code, system tools, obscure Perl libraries, etc. It does this by “adding an application deployment engine on top of a virtualised container execution environment”, which means that it is similar to VirtualBox, but that it runs on top of an operating system’s kernel and does not requiere an emulation layer. It is then an incredibly light, fast and efficient environment in which to run your code, reason why it quickly became a hot topic among coders. Advantages for molecular ecologists? Many. Firs one: you can install and run a given bioinformatic software (you name it) in any operating system (Mac, Linux or Windows >7 64 bits) in such a way that the installation of this software is independent of anything else, including the host OS. Meaning you can do all the sudo you want without breaking your computer anymore (hooray!). Second: you can add to your beautiful-reproducible-research the ultimate step of making reproducible the whole system where your code was run. Convinced? Here a very easy Docker installation and first steps tutorial. First pull the Ubuntu image from docker-hub, a Docker repository of common software and OS. (that pulled the latest version, but we could also had specified which one we wanted, eg: docker pull ubuntu:14.04). And that’s it, root@4ff0be4995f0:/# means that we are root inside an Ubuntu container (named 4ff0be4995f0) and that we can do anything we would do from an Ubuntu Terminal, in this example a simple ls and the classic echo "Hello world". 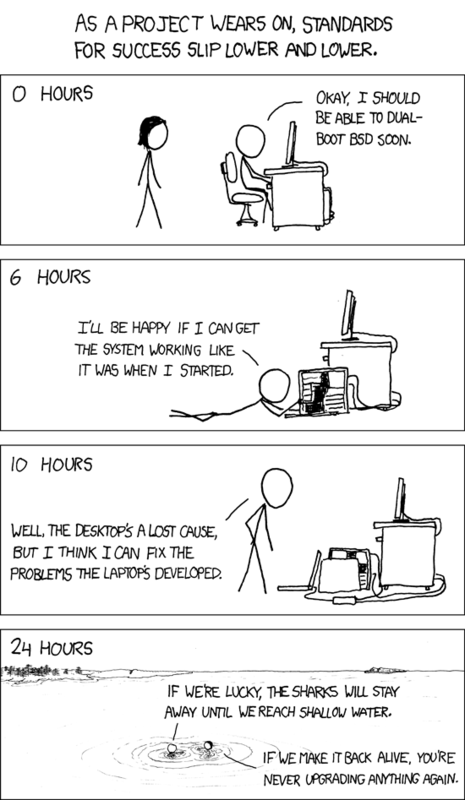 We can install all the software we want there, use it for ensambling a transcriptome or whatever, exit and come back to it again. We can also access data outside of the container (for that you need to mount a volume when you run the container). No index, query, or output file specified! a mixture of paired and unpaired. Specify "-" for stdin. sequences themselves, if -c is set. Specify "-" for stdin. If you clicked the links above you may have noticed that Biodocker and Bioboxes are missing several programs that you may work with. The nice thing is that we all can contribute writing dockerfiles and developers could include a dockerfile as an install option. There is much more to Docker than what I introduced here. For instance you can build a cluster using Docker Swarm. Docker is a hot topic among computer scientists and developers for a reason. It has just started to be used by the biologists community, but it has a huge potential. I think we will be seeing more and more of Docker soon, as it seems to be the natural next step to make our work easier and our bioinformatic analyses more reproducible. This entry was posted in bioinformatics, software and tagged application management, Docker. Bookmark the permalink.